We often hear that our customers want a better option to print a lot of cases or statutes at once. Some of you love our traditional method of compiling all your cases and statutes into a single file while others wanted an option to save everything separately; as of yesterday, we’re helping you do both. In the above example, I added 11 U.S.C. § 101 et seq. (Fastcase 2013) to the print queue. 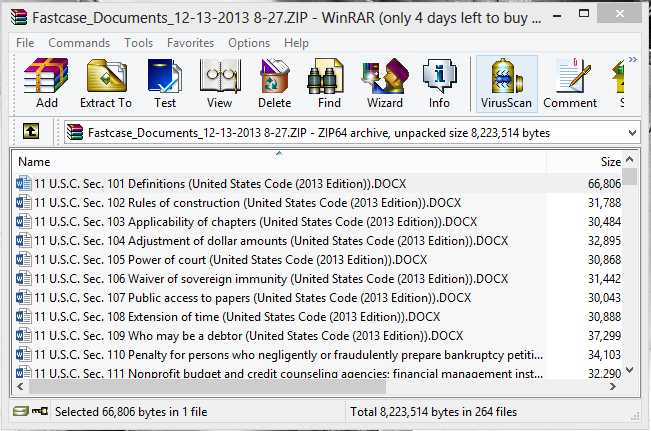 Title 11 contains 264 documents which were all given to me in the zip file shown above. I should also mention that while the print queue was previously limited to 50 documents, it is now completely unlimited (although you will still be limited to saving 500 documents from it at a time if saving in separate files, or 50 if printing in a combined file). But wait: there’s more. We figured that since we’re giving you the ability to print a lot of cases and statutes at once, why not make it even easier to add the documents you need? Now, when in statute browse mode, you have the option of adding the entire title you’re browsing without having to “step up” a level in the document hierarchy. This will make it much easier for you to add the titles and sections you want without having to jump around the index. These are the first of a long series of changes coming in 2014 designed to greatly improve the Fastcase experience. Stay tuned to our blog and Facebook page to stay abreast of these changes as we push them out.